With a stellar lineup of speakers and must-attend workshops, this is a web design and development event not to be missed. We’re delighted to announce that Generate New York, the event for web designers and developers, is back in 2018. Generate returns to the Big Apple between April 25-27 and promises to be bigger and better than even before. Held at the Metropolitan Pavilion Chelsea, next year’s unmissable conference will feature a day of practical workshops followed by an inspirational single-track, two-day conference. We’re super excited to share with you a preview of some of the world-class names that’ll be speaking at Generate New York – and there’s even more to be announced. Speakers include information architect Abby Covert, brand and content strategist Margot Bloomstein and author of The User's Journey: Storymapping Products That People Love, Donna Lichaw. We’re also bringing product designer Amélie Lamont, superstar developer Wes Bos and design advocate at Adobe Val Head to the prestigious Generate stage. Site performance engineer Henri Helvetica will also be there, as will Dan Mall, Jason Lengstorf and Daniel Schutzsmith. Cynthia Savard Saucier, director of UX at Shopify and author of Tragic Design, completes the star-studded lineup. And don’t forget, we’ll be announcing more speakers soon. We’ve put together an early bird offer that will give you $100 off your ticket. Be quick though – this special offer runs out on November 29 and tickets will go quickly. What are you waiting for? 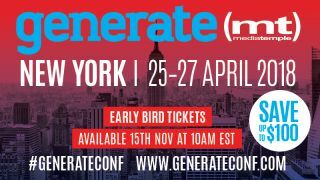 Head to generateconf.com now to book your seat at 2018’s biggest and best web design and development event – just click through to get tickets for the New York event and you'll see the early bird ticket options. How accessible are your designs?